In 1993, UFC 1 took place. The winner, Royce Gracie, became a legend in the sport that day. Another legend, Mike Tyson was in prison in ’93, and would never be the same again afterwards. But that won’t stop us from having some fun. Let’s go around the horn and see who would have won between Gracie and Tyson sometime in that early 90s timeframe. It would be a battle of two of the biggest legends in combat sports. And we have four legends of our own to discuss it. Dave “The Juice” Sadler, Beyond the Cage Podcast: So I received this email wanting to get my thoughts on a Royce Gracie vs Mike Tyson bout. Easy!!! Royce wins via 1st round SUB. Going into this match-up Tyson would have to learn too much to counter the talents of Gracie. On the other hand Royce would just need to get the fight to the ground without getting his head knocked off. Do you wanna know which boxer I think could beat Gracie?? DO YA?????? King Hippo…..once he got on top of Gracie I don’t think Royce wouldn’t have much of a defense for his weight. King Hippo wins at 37 seconds of the first round via Ground and Pound. Juice OUT!!!!!! Ray Flores, Fighting Words with Ray Flores: Tyson…he was off the charts punching power wise and his intimidation was through the roof. Royce would be knocked unconscious before he even lays a hand on Iron Mike. Steve Sadler, VigilanteMMA Founding Editor: We’ve beaten the MMA vs. Boxing horse to death, but this isn’t such a case. Royce wasn’t a true mixed martial artist at that time; he was a BJJ artist. And Tyson wasn’t Art Jimmerson. 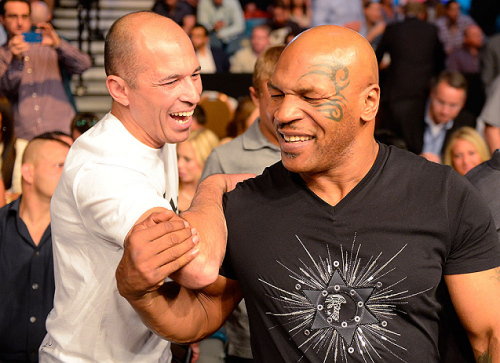 If they faced off in the cage, Tyson would have been all over Royce in about 2 seconds. Hell, he overwhelmed professional boxers—great ones—who are supposed to be trained to avoid that kind of charge. If it goes to the ground, yes, of course Gracie wins easily. But Tyson was so fast, powerful and unpredictable; the only way this goes to the ground is if Iron Mike slipped on Gracie’s brains which would be scattered on the mat. Any modern MMAer (from the past 10 years) would have the advantage, but in this case, Royce would have bitten off more than he could chew.